This page lists changes to vRigger version 10. This version was replaced with version 10.1. A free update was issued today that improves product stability. This was the last release of version 10.0. See the version 10.1 revision history for newer versions. A free update was issued today. This version has several changes that improve usability (e.g., rope dots and slack points are hidden when dragging rope benders) and that improve product stability. This update is free to all customers who own version 10. The most recent gear was released January 6, 2015. A free update was issued today that simplifies the downloading and installing of program updates. It also includes a dozen smaller improvements. vRigger version 10 is a major upgrade that includes dozens of new features and more than 30 new pieces of gear (depending on which gear industries you licensed). This page explains many of the enhancements. Version 10 allows you to move gear in front of, or behind, other gear. You can change the order from the Home tab on the Ribbon or using the new "selection pane." Watch this video to learn how to arrange gear and use the selection pane. Watch this video for tips on inserting pictures. Version 10 lets you "lock" gear on the workspace. When gear is locked, a small padlock appears in the center of the gear. All interaction with that item (e.g., mouse clicks) is then ignored. This is very helpful after using the new Insert Picture command to insert a background image. Watch this video for more information on locking gear. A new panel was added to the Forces page of the Gear Builder that lets you control the force labels that are displayed next to the gear. Version 10 added 34 new pieces of gear. Added a backpack. The backpack is helpful when creating cravasse rescue systems. Added an overhand bight with an adjustable loop. The "overhand" sample file shows how to change the size of the loop. Added a Prusik hitch with an adjustable loop. The "Adjustable Prusik Hitch" sample file shows how to change the size of the Prusik's loop. Added an interlocking bowline snippet that allows you to quickly add interlocking bowlines to your workspace. 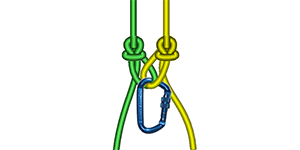 The "Interlocking Bowlines" sample file explains how to create the interlocking bowlines. Added four "silhouette" men. The "Silhouette Men" sample file provides tips on using the silhouette men. These men are helpful when creating simplified illustrations. Added an MSR snow picket. Added a Safety Tec Duck ascender. The Duck ascender is only available when vRigger is licensed for the optional industry gear kit. Added a Petzl TIBLOCK ascender. Added a Petzl Roll Cab. The Roll Cab is a cable trolley that is commonly used during chairlift evacuation. The Roll Cab is only available when vRigger is licensed for the optional industry gear kit. Added a CMC Enforcer load cell. If you calculate forces in vRigger, the Enforcer will automatically display the forces (in either pounds, kilograms, or kilonewtons). Added a generic load cell. As with the CMC Enforcer, this load cell displays forces. Added a Goblin fall-arrester. The Goblin is only available when vRigger is licensed for the optional industry gear kit. Added four new CMC MPDs (i.e., the 11mm and 13mm models in both raising and lowering configurations). The "MPD" sample file shows how to use the MPDs. Added an overhand knot for webbing with an adjustable loop. Added 15 new sample rigging files. These files provide tips and tricks that are helpful when using vRigger's gear. A new message bar is now displayed above the vRigger workspace. The message bar displays helpful information as you work within vRigger. Added a new "Reverse Rope Routing" option to the Home tab and the Properties pane. This swaps the rope's entry and exit locations. You now can save the workspace as a tif file (in addition to the image formats that were added to version 9.0). A new program option was added that allows non-opening gear to connect—try it. You can now rotate gear from any of the four corners (rather than the single "blue rotation handle"). The gear rotates 20 times faster than previous versions. When multiple pieces of gear are selected, you can now rotate the gear using a Microsoft Word-like "rotator on a stick." A program option allows you to display this rotator when a single item is selected. You can now rotate slack points, rope joiners, and the dots at the end of webbing to control the "twist" in webbing. Numerous Photoshop-compatible hot keys were added. Pressing the Control key and rolling the mouse wheel now changes the zooming. Pressing the Shift key and rolling the mouse wheel now scrolls horizontally.